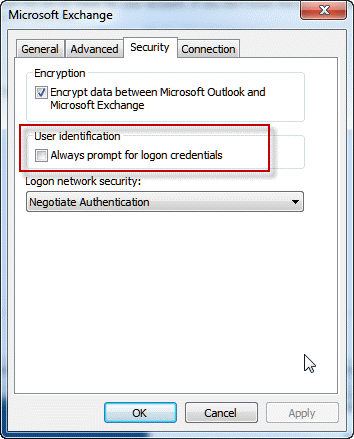 You have Outlook set to automatically log in using Windows credentials. In this case, anyone using your computer can open Outlook and access all contents of your mailbox without a password. When you use cached Exchange mode, anyone can open Outlook and view items already downloaded by cancelling the login dialog. The only way to prevent this is by locking the computer when you aren't using it. Click More Settings then Security tab. Now every time you open Outlook, you'll need to enter your password. If Outlook is closed, no one using your computer will be able to open it without knowing your password. In really old versions of Outlook that don't have the Always prompt for credentials option, you need to set the Logon network security to None for the method of authentication. Once Outlook is opened, the mailbox contents can be viewed by anyone with access to your computer. When you use cached Exchange mode, anyone can view items stored in the ost file by cancelling the login dialog. The only way to prevent access is by locking the computer when you aren't using it.